S. CRAIG TAYLOR, Jr: I regret to inform my many friends in the hobby of the passing of our longtime friend. Craig was a prominent wargame designer who left his mark on the genre with designs for such varied concerns as Battleline, Yaquinto Publications, Avalon Hill and Lost Battalion, among others. His work was steeped in his background as a miniatures enthusiast and a keen interest in military history— an area of expertise in which few were his equal. He authored virtually dozens of games, but will probably be best remembered for his seminal work on Wooden Ships & Iron Men. I had the pleasure of working with Craig for nearly 20 years at Avalon Hill and admired him for the honesty and principles with which he lived his life as well as his obvious skills. My life is richer for having known him. He will be sorely missed. AUCTION SOLD OUT: The WBC Auction reached its ceiling of 550 lots in record time and is now closed. The full list of lots will be posted before WBC. The Auction Store remains open and will continue to accept registrations. Items will not be accepted at the store which have not been pre-registered. Get the details at http://www.boardgamers.org/wbc/auctionstore.htm. PROGRAM ON LINE: The 2012 program containing the complete alphabetical and chronological schedule is now posted on line. This is a B&W copy identical to that provided at WBC. A colorized version, available only on line, will be posted soon. Other scheduling aids are also provided to help you plan your WBC week. Choose from among the Custom Scheduler, an All-in-One schedule, or several downloadable pdf pocket schedules in color or black and white. All of these can be found at http://www.boardgamers.org/wbc/schedule.htm. An iCalendar version, created by Craig Trader, is also posted for use with electronic applications such as Google Calendar and Microsoft Exchange. 2011-2012 YEARBOOK: The latest BPA Yearbook is now available on line. Printed versions will be distributed at WBC registration to Sustaining members of record by Feb. 28, 2012 and Tribune members of record by April 30, 2012. Additional copies will be on sale at WBC for $10 each. All others interested in our annual summary can download theirs for free at http://boardgamers.org/yearbook11/print/. ELECTION TIME:Only three weeks remain to cast your vote for up to three members to serve three-year terms on the BPA Board of Directors. Get the information at http://boardgamers.org/election2012.htm. As usual, voting is effortless and takes only a moment thanks to the electronic ballot at http://boardgamers.org/forms/BoardBallot.shtml. Voting will remain open until July 15th. All members (anyone attending WBC for more than one day are members) are urged to vote since validation requires sufficient membership participation. REGISTRATION PAGE UPDATED: WBC's Pre-Registration page now lists the first 700+ pre-registrants at http://boardgamers.org/wbc/prereg.htm. Use this page to check the status of your registration, troll for teammates, rides or roommates, or even Open Gaming matches or baby sitting gigs. Send your requests to acd@boardgamers.org. HOTELS: Both the Host and the Continental have long since filled their blocks for WBC. However, this is about the time when people whose plans have changed cancel reservations so you may be able to pick up a cancellation at the last minute. The Continental will continue to take reservations on an If Available basis at the WBC rates but would advise those who have not yet booked to do so ASAP asthey will be at capacity very soon. The good news is that there are many hotels of all price ranges in the area so procrastinators can still find lodging in the vicinity. ALLIANCE DEMOS & SAMPER SHOWCASE: We again welcome the sponsorship of Alliance Distributors who will be demonstrating a number of the latest game offerings the industry has to offer in the Showroom. They will be joined by Tom McCorry's crew of 'splainers demonstrating new game offerings on Tuesday during the Sampler Showcase. Scheduled offerings include: 1989, Manhattan Project, 1812: Invasion of Canada, Lancaster, Eclipse, Belfort, Ares Project and Glory to Rome. See http://www.boardgamers.org/wbc/sampler.htm. Tom needs more 'splainers so if you'd be willing to teach a game, let us know. NEW SOUVENIR SHIRTS: This year's silk-screened souvenir WBC T-Shirt will be a departure from prior offerings. 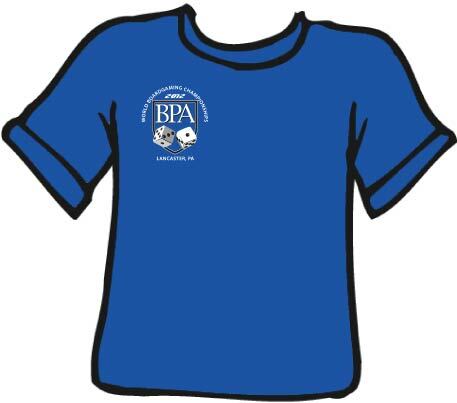 The BPA logo will be replaced by a shield shaped icon over the right breast and the pastel- colored fabric of the past will give way to a dark blue that will remind baseball fans of a certain Evil Empire. Quantities will be limited though so if you want one be sure to pre-order it. We will take COD orders for the ultimate in convenience—just email Don at conventiondirector@boardgamers.org and state your size and we will put one aside for you for payment upon arrival. LIBRARY INVENTORY UPDATED: The WBC Game Library is in the process of soliciting donations for the 2012 season. The center piece of the Lancaster Showroom's 13,000 sq ft Open Gaming Dinner Theatre made over 1,200 game loans during WBC in 2011 and an even bigger assortment of the newest games is expected in 2012. See the current inventory at http://boardgamers.org/wbc/library.htm. Donations are gladly accepted from any source. TEXAS ROADHOUSE NIGHT: The popular steakhouse located directly across the street from the Host will again be hosting a fundraiser night to benefit the BPA Gaming Library on Tuesday, July 31, from 3 to 10:30 PM. So, if you're not an Auction follower, plan on eating early Tuesday with their $7.99 specials (before 5 PM) and enjoy your best meal of the week before the tournaments start again on Tuesday night. Check out the menu at http://www.texasroadhouse.com/restaurant-locations/pennsylvania/lancaster. Submit the Texas Roadhouse ad from your program and 10% of your bill will benefit the upkeep of the Game library. WBC TEAM TOURNAMENT NEEDS ENTRIES NOW: The usually late arriving entries for the Team Tournament seem to be outdoing themselves this year to see who can be last in line. Our grumbling CD who needs no excuses to maintain his grumpy rep is tired of staying up past his bedtime accommodating late entries. Give the ol' geezer a break and enter those teams early this year so we can post the odds in a timely manner! Who will win the bracket busting prediction contest this year? Can anybody stop Nest of Spies from taking their fourth title? The Happy Handicapper awaits your pleasure. Send your team name (max 21 characters including spaces) for four pre-registered only players and their game choices to conventiondirector@boardgamers.org BEFORE July 21st. And if you are new to the Team Tournament or are changing your team name send in your logo (or an explanation of same) to acd@boardgamers.org so we can immortalize your quest with our zany team logos. Check the upcoming July newsletter for this year's odds. WBC PUBLICITY: Those willing to lend a hand by spreading the word for WBC will find the usual assortment of aids available for download on our publicity page at http://www.boardgamers.org/wbc/publicity.htm. Posting a copy at your local club or gamestore would be much appreciated. Available materials include both a low and high resolution Poster, Flyer, postcard and press release. YOSHI DOMINATES! Even as temperatures soar in Lancaster, Hell hath, if not frozen over, at least gotten decidedly cooler. After 18 years of also ran status, Mark Yoshikawa has emerged from the shadows to take BPA wood with his first tournament victory over a record field of 44 duffers in PBeM Pro Golf. After three rounds, everyone's favorite referee emerged with a final score of 18 under par and a five-stroke cushion over the rest of the field. Others earning easy laurels were John Coussis, Mark Mitchell, Chris Kizer, Jeff Mullet and Bruce Monnin in that order. Check out the latest laurel totals and other scintillating golf details at http://www.boardgamers.org/yearbook12/pgfpge.htm. THE FIX IS IN: GM Bruce Monnin won his own March Madness tournament despite the largest field yet for the 9th Annual email hoops event. 46 entrants played 91 games en route to the GM claiming his third PBeM title with a 75-73 win for his 8th seeded Washington team over Bill Edwards 46th seeded Wichita State squad. Also earning laurels were Sean McCulloch, Robert Rund, Debbie Gutermuth and Jeff Finkeldey in that order. Updated laurel counts and more tournament details can be found at http://www.boardgamers.org/yearbook12/mmspge.htm. DELUXE BITTER WOODS: Another PBeM tournament for the 4th edition is scheduled to begin Sept. 1. Check out the details at http://home.comcast.net/~bitterwoodsweb/BWHome.htm. WAR AT SEA: Prolific PBeM GM Bruce Monnin announces the start of another War At Sea PBeM tournament with a less ambitious format and hoped for faster ending than its predecessor. The Single Elimination event will commence Sept. 1. Check out the details at http://www.nktelco.net/bdmonnin/was_home_page.html. FTP PROGRESSES: As scheduled, the third round of the For The People PBEM Tournament ended Memorial Day weekend. The Union won 11 games to the CSA's 7 with one additional game adjudicated in favor of the Union on the basis of time delays. The record of non-adjudicated games for the tournament after three rounds is 38-23 in favor of the USA. If the trend favoring the USA continues once the players are in the elimination brackets, the addition of some play balancing rules may have to be considered. We are, however, a full year or more away from having to seriously consider that option. Additionally, it will be useful to see how the WBC Tournament plays out from a balance perspective. In the third round two previous laurel winners were defeated, but not knocked out of the tournament. Mike Ussery’s CSA was taken down by Alberto Molina’s Yankees. Gary Kirk, a relative newcomer, showed that he is a force to be reckoned with by defeating Tim Tow’s rebels. Seven players remain undefeated: James Pei, David Dockter, Michael Mitchell, Nick Pei, Gary Kirk, Doug Pratto, and Alberto Molina. At the end of the fourth round there will be 3 or 4 undefeated players who will be seeded into the single elimination bracket. There will also be seven or eight players with 3-1 records. The remaining 4 or 5 slots in the bracket will be filled by lottery from these worthies. Please visit our tournament website to see the names of all the great players still hammering it out: http://www.angelfire.com/ny4/gmtom/FTPtournament.htm#Round%201%20games.